Maximum glowing skin is what I hope to someday achieve. Many have succeeded in that department, I, on the other hand, am slowly getting there. Thankfully there's a wide range of skincare products that can help. Some are more budget-friendly than others and some are cleaner in terms of ingredients used. With a well know and trusted skincare brand such as Aveeno, I was ecstatic to try out their Positively Radiant MAXGLOW collection. 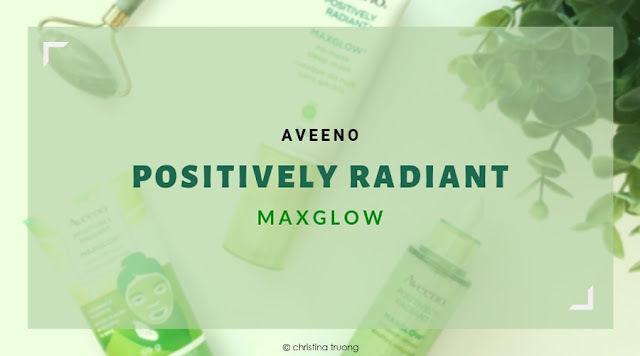 Aveeno Positively Radiant MAXGLOW contains: Total Soy Complex which helps even skin tone and improves skin texture, while Kiwi Complex helps attract and locks in moisture for luminous skin. They are also hypoallergenic, paraben-free, phthalate-free and non-comedogenic. Enhance skin’s natural radiance and give it a boost of moisture with Aveeno Positively Radiant MAXGLOW Infusion Drops. This hydrating facial serum provides 48 hour moisture for a lit-from-within glow while also helping to even skin tone and texture. Use these drops alone as a serum or drop them into your favourite moisturizer. A serum consistency that is not too runny but not too thick. It has a fresh soy scent that is very soothing. When I applied the drops on the palms of my hand and smooth it directly onto my skin, the serum set in immediately and my skin instantly felt smooth. When I mixed the drops with a moisturizer, it also kept my skin feeling smooth, hydrated and moisturizing. After a few days of use, my skin looked and felt smooth, dewy and glowing! Get softer, more radiant skin with Aveeno Positively Radiant MAXGLOW No-Mess Sleep Mask. This nighttime face mask actively works while sleeping to help replenish lost moisture and even skin's tone and texture. Infused with Aveeno's total soy complex and kiwi complex, this mask attracts and locks in moisture to intensely hydrate overnight, for a more radiant complexion. Sleep masks aren't my forte because I worry it'll get all over my bed but who doesn't love waking up to soft, luminous skin?! I sure love it! The No-Mess Sleep Mask comes with a paddle applicator which allows to keep hands clean while applying. It's also a great way to spread the product evenly and mess-free! The sleep mask has a gel-like texture, while it sits on the skin, it has a cooling and refreshing feeling. The mask doesn't skin into the skin but sits onto the skin. After a couple of minutes, I can still feel product on my face but it doesn't create a super sticky feeling and I was able to sleep comfortably without worry. By the time I woke up and washed my face, my skin felt refreshed and hydrated. Reveal smooth and even skin with Aveeno Positively Radiant MAXGLOW Peel Off Mask. This soap-free, no-rinse exfoliator infused with alpha hydroxy acids, soy and kiwi complex lifts away dull, tired skin in one swift move. Simply apply, let dry and gently peel off! I LOVE peel-off mask, the satisfactory of peeling off the mask in (hopefully) one go simply makes my day! The Aveeno Positively Radiant Maxglow Peel-Off Mask did exactly what most peel-off mask does. When applying the product, it had a bit of a refreshing feel. Once I covered my entire face with the product, the mask sets in and dries smooth and transparent after a couple of minutes. After leaving it on for about 20 minutes and peeling it off, my skin felt and looked clear and smooth. Overall, if you're looking for products that provide your skin with a clear, refreshing glow, give Aveen Positively Radiant MAXGLOW a try. What are your thoughts on Aveeno Positively Radiant MAXGLOW? Would you give these products a try? Disclaimer: Products featured were provided by ChickAdvisor for review purposes. Views expressed are honest and of my own. Amazon links are affiliate links.